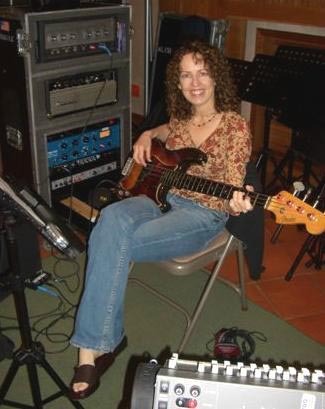 Alison Prestwood has played bass on recordings by Brooks & Dunn, Little Richard, Peter Frampton, Jessica Simpson, Olivia Newton-John, Blake Shelton, Trace Adkins, Marty Stuart and Jim Lauderdale, to name just a few. She's played live with Rodney Crowell, Patty Loveless, Shawn Colvin, Olivia Newton-John, Vince Gill, Amy Grant, Wynonna Judd, Trisha Yearwood, Pam Tillis and so many other artists and songwriters. The following is taken from a 20 minute interview done September 30, 2009. Meet Alison Prestwood. Bronson: Where are you from and how did you come to find yourself in Nashville? Alison Prestwood: I'm from Montgomery, Alabama. I grew up there, I went to the University of Alabama right after high school. I played in some jazz ensembles and bands playing fraternity parties and all that in college. Graduated with a music degree, moved to Atlanta and lived there for 12 years playing bars 5, 6 nights a week. Played on a few jingles and whatever they would have there. Moved here to Nashville in '93. I just never was a night person really, I'm a morning person and I thought well this is it. I'm gonna give up the night life and go see about being a studio musician full time. Bronson: So how many sessions do you think you've done since you've been in Nashville? Alison Prestwood: Gosh I don't know, I would hesitate to even guess. It's been pretty full, I guess it took 3 or 4 years to get a good solid start on it and I suppose by '97 I had a good start. Now it's 2009 and it's been pretty so solid all the way. Bronson: When you go to a session what do you take with you? Do you take one bass, do you take several basses? Alison Prestwood: Always more than one. There's two ways of doing it, one is with cartage in which case I have a rack of amp heads brought and a direct signal and I also have a trunk of, I think I have 12 basses in that one. I ususally have my favorites at home so I'll bring two or three from home. If it's non cartage I have a small rig with one bass head and I usually bring two to three basses with me. Bronson: You've also toured with a lot of different artists. Do you have a preference between playing live or in the studio? Alison Prestwood: Studio (laughing). Studio for sure, just the ease of it. You know I really love the touring I've done, I've been really lucky to get with some great people. I think I was here only a few months and I managed to get the Rodney Crowell gig which set me off on just the best path. Good solid music and sort of the "well if you play with Rodney you must be good", initial outlook, so that helped me a lot. I've loved the road gigs but I just like being at the house. That kind of lifestyle fits me. Bronson: You've also played a lot on TV. Alison Prestwood: I have, I guess a lot of house bands. Harry Stinson used to be, probably still is, the musical director for a lot of award shows and he got me on a lot of that stuff. Bronson: So you've worked with a lot of producers in Nashville. Is there one or two you'd like to mention that you've learned from as a bass player while you were making records? Alison Prestwood: Paul Worley has been very helpful because he really does know what he's doing. Trey Bruce is a producer and he's also a successful songwriter. He's one guy I would point out who found his demo session band in the late 90's and kept us wih him through his records and all that and thats a guy I really appreciate because it's unusual in Nashville to play with a set band in the studio a lot. In another way it's good that we see different people a lot but Treys' bands been just one I would point out as being a solid band that went from demos to records and I would give Trey the credit for that, and I learned a lot in that situation. Bronson: Didn't you also just work with Trey with Peter Frampton? Alison Prestwood: Gosh it's been a year ago or so now, yes. Bronson: Bet that was fun. Alison Prestwood:(laughing) It was fun. Every now and then you work with somebody and you kind of look forward to it because they're famous or whatever, but what really gets me is when you know, you start running the song down and the person sings and you go, "wow that really is him", and Peter Frampton was one of those guys. You start running a song with him and you go, "wow, that's Peter Frampton", (laughing). Bronson: Is there anybody you always wanted to play with that you haven't had a chance to yet? Alison Prestwood: Paul McCartney. He's the reason that I picked bass in the first place. Bronson: Well you play in a Beatles tribute band don't you? Alison Prestwood: I do, Fab. We play once a month at 3rd & Lindsey usually, that beautiful early show from 7 to 9. I've been with Fab for 3 years I think, a great bunch of guys and it's so much fun playing those parts. You can listen to the Beatles songs a million times over as we all have but until you sit down and learn the stuff you really can't see how it is on the micro level. Bronson: You play with another group around town don't you? Alison Prestwood: Pat Buchanans' band, so it's Pat Buchanan, Tom Bukovac and Greg Morrow. That's mostly Pats' music with some covers thrown in and that's a full out 4 peice rock band so I really enjoy that. The two bands are good because one is the Beatles which I love and the other is just full out go for it kind of band. Bronson: You've been nominated multiple times for the Academy of Country Musics' Bass Player of the Year award. What is it, 5 times? Alison Prestwood: 4 times but you know the guys that win it, there's no denying how great they are. Glenn Worf, Michael Rhodes and these guys that when I moved here in '93 they were the top of the heap then and they still are and they deserve to be. So you know I would love to win it but I understand every time that I don't. Bronson: Well it's such an honor to get nominated. That's just huge. Alison Prestwood: Totally great, it's really fun. I feel like I've accomplished something by moving here with that. It's a validation. Bronson: A lot of people that read the magazine, that read my columns are either new to Nashville or they've been here awhile but they're still trying to break into the studo world to play on records. Is there any advice you might have for someone on how to pull that off in the year 2009? Alison Prestwood: The advice that comes to mind is the same that Glenn Worf gave me when I moved here which was, "there's always room for another good player. There's no short cut, just keep your goal in mind and follow it." You can get distracted on the road for instance, if you get to used to having that money in the mail box every 2 weeks which is nice, but at some point if you believe in yourself and you really want it badly, you have to pretty much get off the road and get around town. Get your face seen around town and be consistent, be pleasant, and have your gear and your act together and you have as good a shot as anybody.